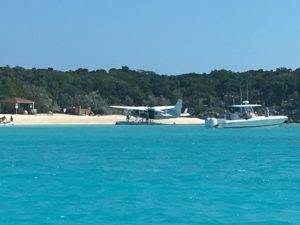 The trip from Black Point to the Staniel Cay area was a quick one; just 5 miles around a few shallow areas. 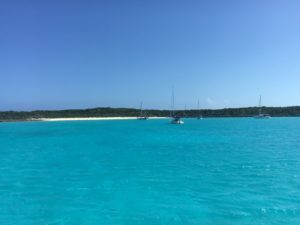 The winds were a bit sporty, but we were going with the winds and waves so we had an easy sail to just off Big Majors Spot, and its famous Pig Beach. 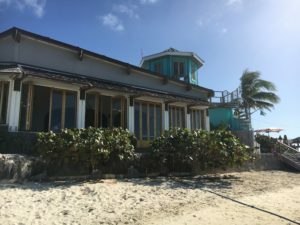 The anchorage right along the beach is very well protected from easterly or northerly winds, and only about 1.5 miles from popular Staniel Cay. 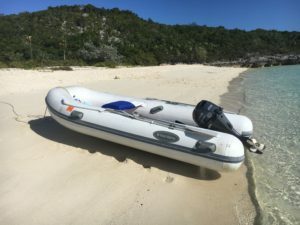 We anchored about 500 metres off the beach, and in retrospect could have gotten a lot closer due to the shallow draft of our boat, as we only draw about 4′ when heavy. 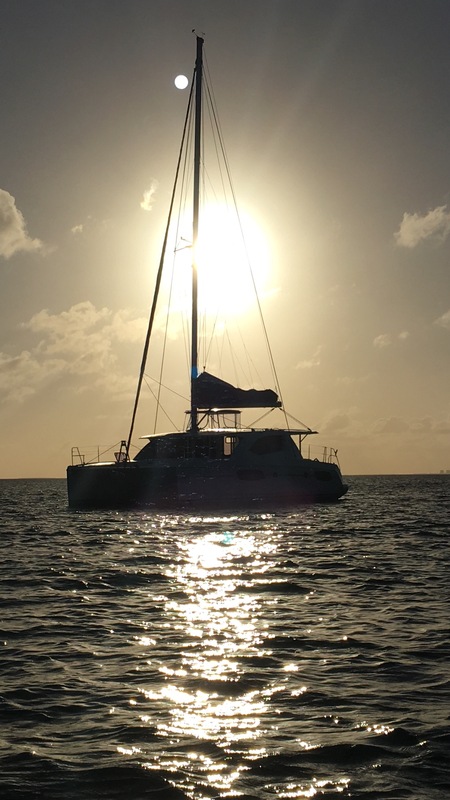 It would have put us closer to some of the tourist boats, but would have put us well away from the other anchored yachts, with a bit better protection from the winds. This guy stood out form the rest of the yachts and mega yachts. 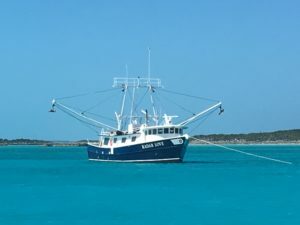 We couldn’t tell if it’s still used as a fishing boat since it was so clean and shiny. It was great to see him there. 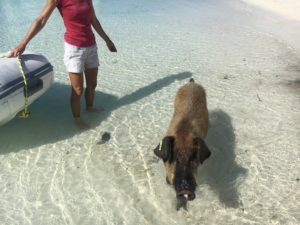 This big sow was not impressed that Christa had no food left, and came after me, aggressively. Let’s just say that I dropped the mouldy bread that I had, and retreated…with grace and honour. There’s no video, so why would you not believe me? I told Christa to go play with one of the babies while I distracted the adults. This was before my graceful retreat, and they all soon found Christa again. 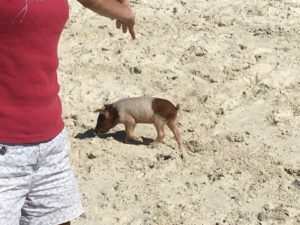 Boats bring in the tourists from all over, just for the pigs. 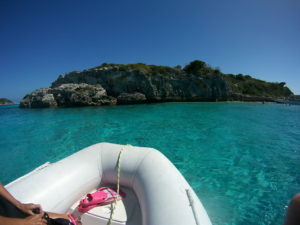 Many people have told us that boats with tourists will come from all over the Exumas. These boats get too close to the anchored boats and unfortunately most pay no attention to the size of the wake they are making. We also noticed a large number of very big needle fish lurking around while we were there. This guy looked to be a good 2.5-3 feet long. 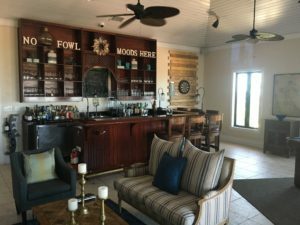 Almost as close as Pig Beach, was Fowl Cay which had a luxury resort we thought we should check out. 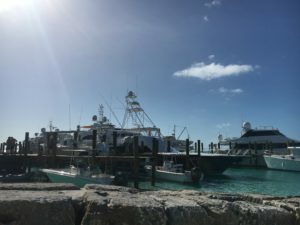 The 2016 Bahamas Waterway Guide that came with the boat, explained there was a very good restaurant that requires reservations, but also a pub(!) that cruisers could enjoy. 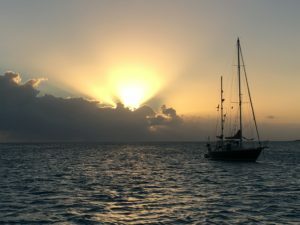 We (at least I) thought, what a great idea to get off the boat, have a few pints and watch the Olympics. 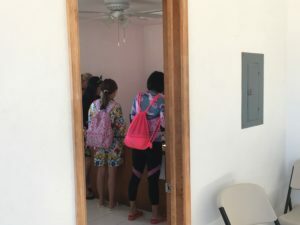 Alas, Sandals had recently bought the resort and all facilities are only for guests. Although, if we really wanted to hang out there, we could make dinner reservations at $140US per person to get access to everything. I decided the pool table, pints and big screen weren’t that important. On the way back from our (read: my) Fowl Cay disappointment, we stopped at one of the many beaches, and had this one all to ourselves. 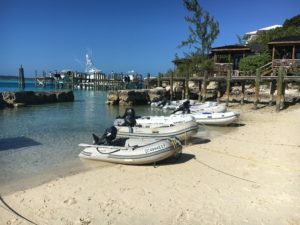 We paddled around the shallow, crystal clear water, and found a few corals heads on the extremities that were home to some of the typical fish in the area. 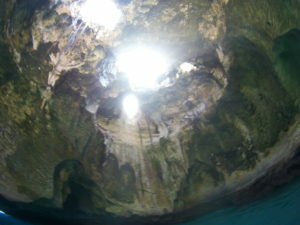 Thunderball Grotto receives lots of press in blogs and guide books, but is very unassuming as you approach. 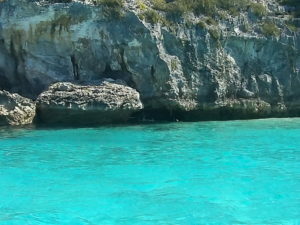 There is just a little crack to the right of the small rock on the left in the picture that has a white rope which leads you into the cave at low tide. 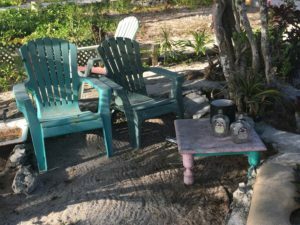 You can still get in a high tide but it would require some skill in free-diving or SCUBA gear. There’s the little opening that we just swam through. We were at about mid-tide on the way out so we had to take care to not knock our heads on the rocks in close quarters with the swell that day. 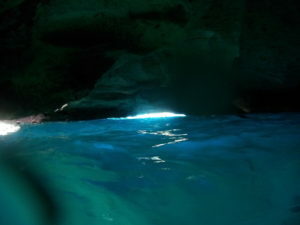 Once inside, the cave opens up with a skylight creating unique underwater views, and it’s absolutely filled with fish! There’s a couple large holes in the dome that let in most of the direct light when the sun is out. We read that some people climb to the top and jump in through these. 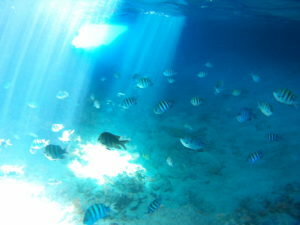 The sun causes some very cool lighting effects underwater as well. Our little GoPro knock-off, an SJ5000, had trouble coping with the big swings in light levels. Everything seemed to come out a little too blue as well. A few washes through some video editing software would probably help…if someone was more ambitious. 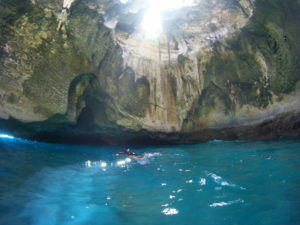 The grotto is definitely worth a visit, provided you have good conditions and come at off-peak tourist times as well, which is completely arbitrary. 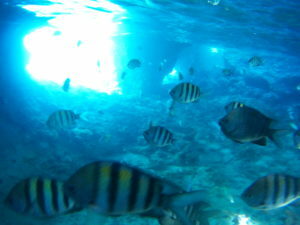 There is enough of a special vibe, and so many fish, you get the sense you are swimming in a large aquarium display. For those apprehensive about confined spaces it may be a bit challenging to get in, but once inside, you are hit with a burst of light from all directions and hundreds of curious (and hungry) fish swarming around you. 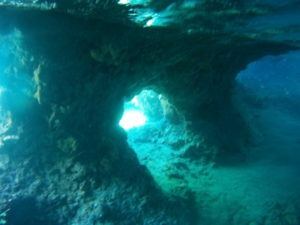 There are numerous smaller caves and tunnels inside, away from the tourists, if you are an adventurous freediver or have SCUBA gear. 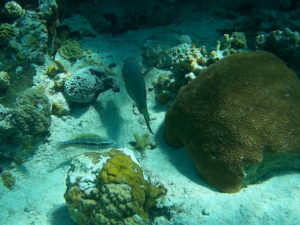 There was lots of sea life outside the cave as well, with a healthy reef that seemed to extend the whole way around the little island. Christa even got to swim with a couple turtles. Exploring outside the cave however, and even getting into it, posed potential issues as there is no division between the swimming and boating areas. 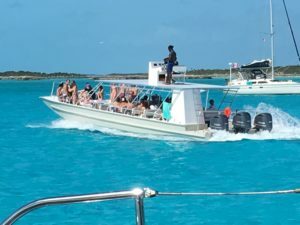 Nothing stopped big centre-console sportsman boats with 3-4 outboards, from roaring right up to where small dinghies were anchoring, with swimmers and snorkelers going in all directions. 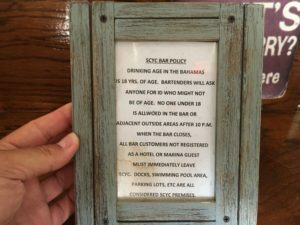 Typically you would expect some buoys, or even a line to tie up your dinghy that would signify, “no boats beyond this point.” Rough swell, inattentive tourists and boat captains, and booze aplenty with no control measures…Asking for trouble? 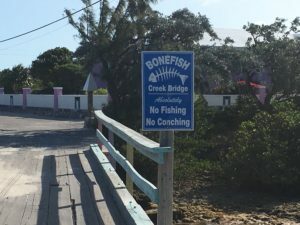 The fish in the area are frequently fed by tourists even though officially everyone is advised not to do this. It’s one of those things everyone talks about, then ignores. 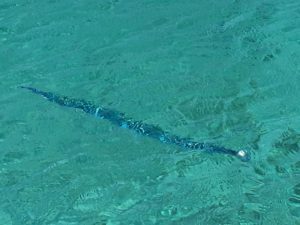 Our camera (and likely the cameraman) didn’t really capture the scene well but just as we were leaving, I noticed hundreds of Sergeant Major fish heading towards Christa looking for some food. When they got no satisfaction and noticed me there, they immediately swung around and headed my way. Remember that scene in Piranha? 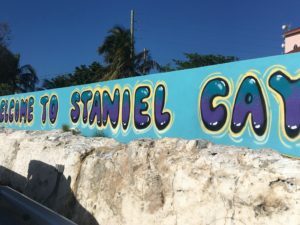 The obvious center of attention on Staniel Cay is the area surrounding the Staniel Cay Yacht Club. 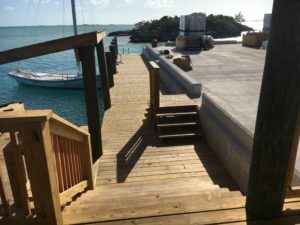 As you approach, there is a convenient little L-shaped breakwater that’s almost hidden, and just big enough to let 8-10 dinghies or other small boats, beach right next to the main building. One of the main attractions after walking off the little dinghy beach is the fish cleaning stand on the wharf. 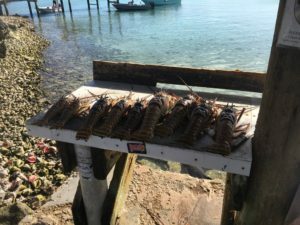 Fishermen clean and display their lobster, hoping to sell them to the many tourists that are milling about. 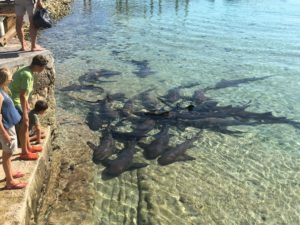 As a result, a great many nurse sharks and a few rays hang out right below the cleaning table. 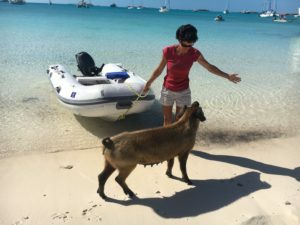 They are all very calm and docile, enough for people to wade right in and pet them without issue. Occasionally, both kinds of fish would seek food from this person, so they had to take care to keep fingers away from their mouths. This all got quite boisterous when a piece of lobster was thrown into the middle of the sharks. One would grab it and take off in a random direction with about half the remainder chasing after it, much like a flock of sea gulls would in the same circumstance. Inevitably, the fisherman would not warn the tourist knee-deep on the edge of the school, causing a few “spirited exits” from the melee. 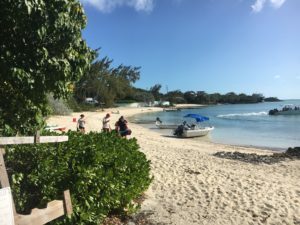 After leaving the Yacht Club, a right turn onto the “main street” takes you past a public beach that a lot of people use to come ashore, or set out on kayak, SUP, wind-surfers, etc. At the end of what could be called the “downtown” was the government dock. 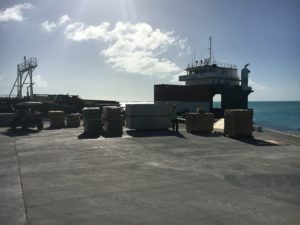 There was a ship that just arrived and was unloading building supplies. 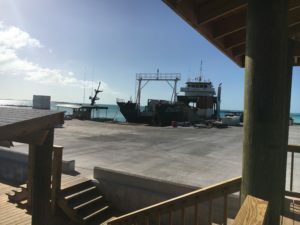 Random trucks would appear, grab something from the dock and vanish. No one tending the piles of goods or apparently keeping track. 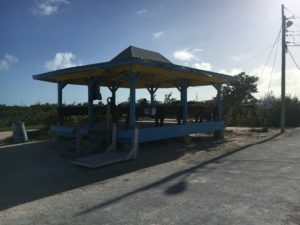 The whole area was pristine looking and newly renovated, except for a public gazebo that looked ready to go over the side. 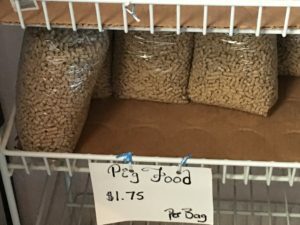 There wasn’t one large grocery store, but 2-3 small ones, and one that doubled as hardware and supply store as well. 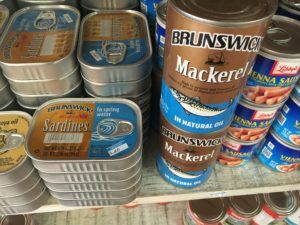 We were only slightly surprised to find a large stock of a variety of Brunswick Seafood items around town. They seem to be everywhere. 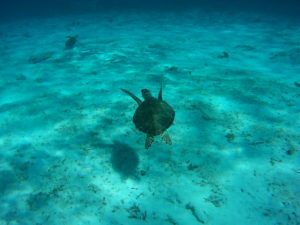 We saw them in the BVI as well. The brand used to be solely owned by Connors Brothers Limited, a company located close to where we grew up in Atlantic Canada. One of many random public service message. 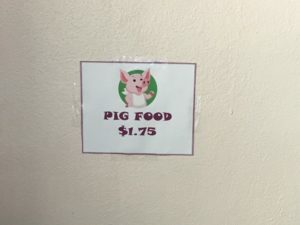 The combination grocery/hardware/supply store sold packaged pig food. 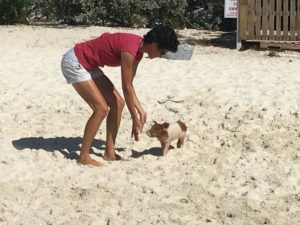 After our experience on Pig Beach, we felt this had “bad idea” written all over it for some unsuspecting tourist that had not been around animals and was used to normal US/CAN tourism protection measures. 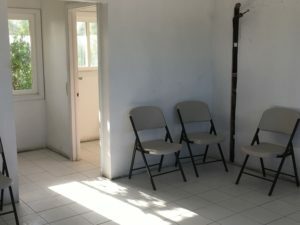 Here is the airport “terminal building.” When we walked past there was a rare rush of activity with 5-6 golf carts dropping off and picking people up. Some Japanese tourists talking to the one “ticket agents” in her office, just inside the indoor passenger waiting area. 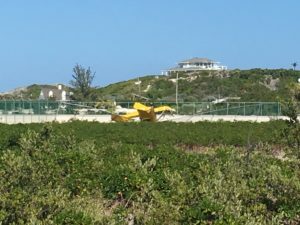 Some poor guy in an ultralight had an argument with the airport fence at some point. Don’t know why they just left it there, perhaps waiting for the investigator to complete his work. 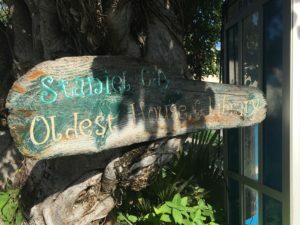 This place is listed in most guides as the oldest house/library on Staniel Cay but unfortunately it was locked up when we went by. 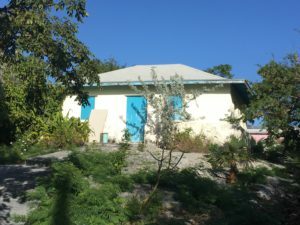 This little private resort was at the end of someone’s yard right next to the health clinic, about 100m from the entrance to the Yacht Club. 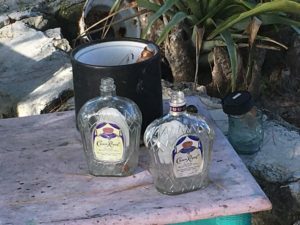 Seems like the place to be with 2 empty Crown Royal bottles on the table. 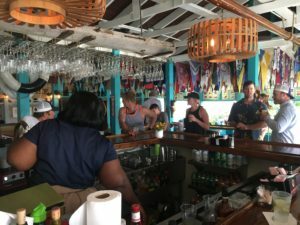 Most businesses and people in the islands multi-task with their chosen employment. 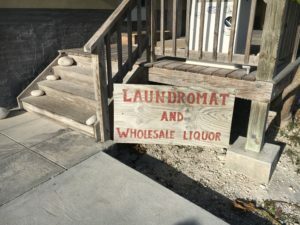 This location was about 5 minutes from the Yacht Club and had a large number of washers and dryers, ranging from domestic sized for folks like us, right up to large commercial units that would cater to mega-yachts. 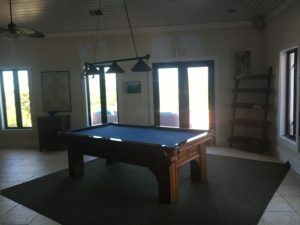 As you wait for your laundry, what better way to pass the time then to slide up to the full service bar (which I forgot to take a picture of) and watch the big screen. They also had a liquor locker where you could purchase your “take-out.” I’m sure this business does very well. 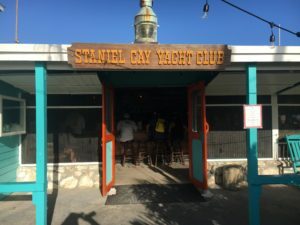 We eventually made it to the famous Staniel Cay Yacht Club itself. It’s a place cruisers (and wannabees) hear about as one of the hallowed haunts of those veteran and/or celebrity sailors that came before you. Picture Jimmy Buffett holding court at the bar, or the Thunderball production crew hanging out during their off-hours. 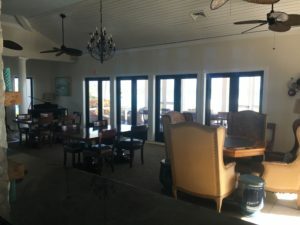 It’s a very nice facility that encompasses a marina, restaurant/bar and cottages right on the water. 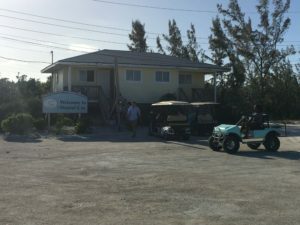 Not a tourist-trap, and one of the nicer facilities we have encountered in The Bahamas. 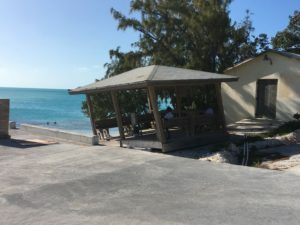 We wouldn’t head to Staniel Cay just for the bar/restaurant, but it was good to hang out there one afternoon for people watching and chatting with our friends from SV Sea Shifter. 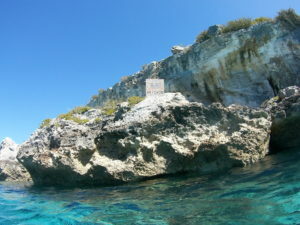 Before we left the area, Christa wanted to snorkel on some rocks that she read had some good coral reefs and sea life. At one point she spotted a yellow moray eel (she spots things way better than me) and said I should go get a video of him. However, this little fella wasn’t happy that I was getting so close. I kept looking over my shoulder to make sure he wasn’t chasing me! 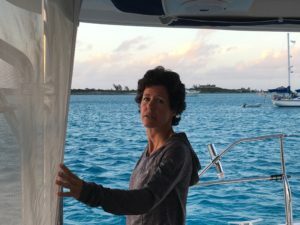 Here’s Christa giving the play-by-play of the other boats coming and going in the anchorage. Dropping and lifting anchor is a spectator sport for those of us on a boat. 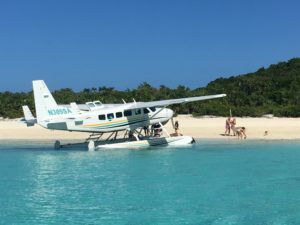 Pretty good spot overall and would likely be a good choice for people to fly into meet a cruising sailboat with the airport and lots of activities in close proximity. 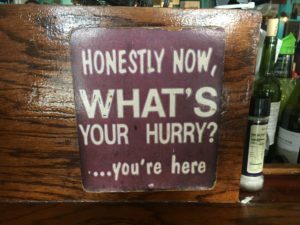 Another excellent detail of you adventures. Really enjoyed it, it’s my morning read.